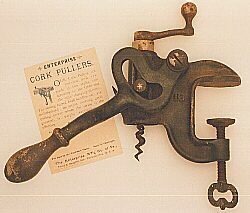 Displaying barmounted corkscrews can be a challenge. 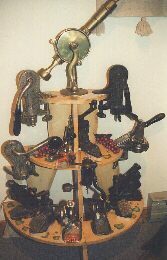 Here are a few mounted on a flower pot stand. At the top is the Rotary eclipse. On the left is a barscrew from Enterprise of Philadelphia, Pennsylvania. A barscrew from Erie Specialty Company of Erie, Pennsylvania is on the right.